5 Frugal Valentine's Day Dates! 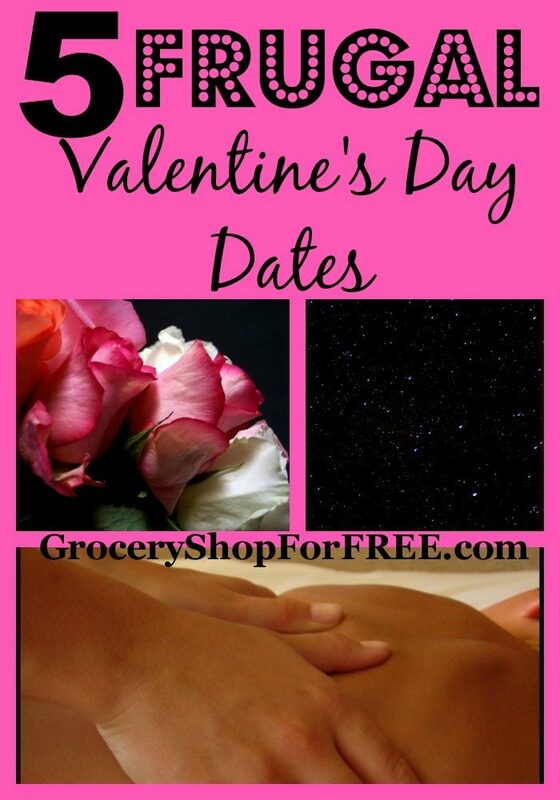 You are here: Home / Valentine's Day / 5 Frugal Valentine’s Day Dates! 5 Frugal Valentine’s Day Dates! Valentine’s Day brings about both excitement and fear in many people. If you are in a relationship it can be a joyful day of shared love but dreadful on your budget. That’s where these 5 Frugal Valentine’s Day Dates come in handy. Not only can you easily impress your lover this year but you can save the money from the pricey date to buy them that gift you know they’ve really been wanting. USE DISCOUNTED RESTAURANT CERTIFICATES. We love grabbing half price or lower certificates on Restaurant.com, Groupon and Living Social. Not only is it a great way for us to find those smaller family owned restaurants in our area but it’s also a great way to save a huge amount of money. Frequently we grab a $25 Certificate for as low as $5 on these sites. Embarrassed about using a gift certificate? Call ahead and make arrangements for a special corner booth and stop by to hand over the certificate early with perhaps instructions to present your date with a rose or other gift at dessert. Save the money for the tip or present instead of the meal. PACK A PICNIC AND STAR GAZE. Sure it’s likely to be a bit chilly out still and an extra blanket or sweater may be necessary but there is nothing like snuggling up under the stars with your lover. Download one of the many astronomy apps to your smart phone and use it to tell you what stars and constellations you are looking at. Snack on your favorite foods (even take out pizza) and talk about your dreams. Sometimes the best dates are the ones you can really block out distractions and connect with each other on. GIVE OR GET A SENSUAL MASSAGE. Grab a bottle of massage oil and light some candles for an evening of close connection with the one you love. It doesn’t take a licensed masseuse to give a decent massage. Typically this kind of romantic evening it’s not really about the quality of the massage itself but about the time and effort spent trying to connect on an intimate level with the one you love. Add in some light music, a romantic movie and perhaps a bottle of your favorite wine and you can melt the heartstrings for sure. VISIT A LOCAL LIVE MUSIC VENUE. Tons of our local restaurants and night clubs have great local musicians who do live performances with special events on holidays. Find a jazz band, classic country group or even a gospel quartet playing at a local bar or restaurant near you. Request a romantic song or perhaps even “your song” to be played and swing your partner out onto the dance floor to reconnect and rekindle romance. TAKE THE KIDS TO THE BABYSITTER AND COME HOME ALONE! All too often we go out for special days but sometimes you just need a few hours alone in your own home to reconnect. Find a babysitter that you can deliver the kids to for a few hours then come home, grab a pizza and snuggle together on your couch watching your favorite romantic movie, sci-fi or horror film. Make out like teenagers and enjoy each other in your own home without the distractions of kids interrupting. It doesn’t take a ton of money to make a romantic evening at home. These frugal Valentine’s Day dates are things you can implement not only on this special day but year round to help rekindle and reconnect with your lover. Sometimes all it takes is them being able to see how important they are to you and that time with you means more than any amount of money you could spend.